Three unlikely friends take control of their office and learn there is nothing they can’t do, even in a man’s world! 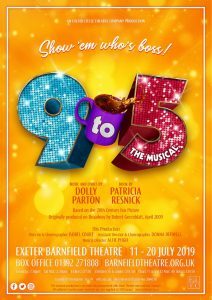 Clock off work and head on down to The Barnfield Theatre for a Dolly good time as Exeter Little Theatre Company (ELTC) present ‘9 to 5 The Musical’. Based on the 1980 hit movie, this vibrant and energetic musical follows co-workers Violet, Judy and Doralee in a hilarious story about friendship, with a good ole dose of revenge, as they look to get even with their sexist, egotistical, lying, hypocritical bigot of a boss. When Violet is passed up for promotion by her tyrannical boss Franklin Hart Jr because she is a woman, she and country gal Doralee – the object of Hart’s unwanted advances – and new girl Judy, share their fantasies of giving their boss the boot! Featuring a Tony award nominated score by Dolly Parton, you will want to set your alarm to make sure you don’t miss out on this outrageous and poignant show. Please note, this musical contains some adult themes.